card text: Name a card. 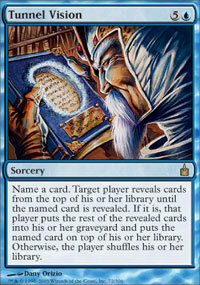 Target player reveals cards from the top of his or her library until the named card is revealed. If it is, that player puts the rest of the revealed cards into his or her graveyard and puts the named card on top of his or her library. Otherwise, the player shuffles his or her library.